Pashupatinath – Great holy Temple of Hindus. Bouddanath Mahachaitya – Largest Buddhists Stupa. Pokhara – The valley of Lakes. Phewa Lake, Begnas lake and Rupa Lake. Full day Jungle activities in CNP. With profound culture and spectacular nature, Nepal boasts plenty of UNESCO world heritage sites, eye popping touristic destination and fascinating National Parks. Kathmandu Pokhara Chitwan Tour is an insightful journey to explore the cultural landmarks of Kathmandu, fascinating beauty of Pokhara and natural wildlife of Chitwan National Park at one go. Kathmandu Chitwan Pokhara tour package is perfect for those travelers who seek the diverse experience of wildlife, culture and landscapes of Himalayan country Nepal. Our tour package itinerary is designed to show you the spectacular natural diversity and beauty of Nepal. Take a refreshment tour and get inspired from our recommended destination and activities and enjoy exploring nature. Kathmandu Pokhara Chitwan tour is ideal for families and group of friends who have short vacation and can be conducted throughout the year. We can tailor the trip to suit your preference and needs. Kathmandu day tour covers the visit to all the cultural world heritage sites in Kathmandu, such as Swayambhunath, Boudhanath, Pashuptinath and Kathmandu Durbar Square. Kathmandu, an ancient city, is home to the plethora of Hindu temples, antique sites, monasteries and Buddhist stupas. It is also considered as an open museum of medieval arts and architecture. In every corner of city, you will discover rich culture, secret temples, colorful bazaars and the friendliest, warmest of greeting. The enchanting valley of Pokhara, some 200 km north west of Kathmandu, is one of the most blessed natural touristic destination in the world. Here you can get the grand view of snowy peaks without having to go on a trek. With engrossing climate, tempting nature and raw beauty of landscapes, Pokhara is blissful respite from the hectic pace of the city life. It is dream come destination for backpackers. Pokhara is also the major gateway to popular Annapurna region trekking in Nepal. The assortment of delightful lakes, magical Mt. Machhapuchhre, highly venerated pilgrimage sites and Sarangkot hill are the major alluring features of Pokhara. The serene Lake Phewa is fed by the glacial river that originates from Annapurna Mountains. With the cluster of luxurious hotels, restaurants and shops hugging its shores, Lakeside, it is most popular hangout spot for travelers around the world. The Sarangkot hill, located 25 minutes away from Pokhara, offers the stunning sunrise and mountain views. The view of lake, township and emerald valley is fantastic. You can also partake in adventurous sports like Paragliding, Bungee jumping and Zip flyer. 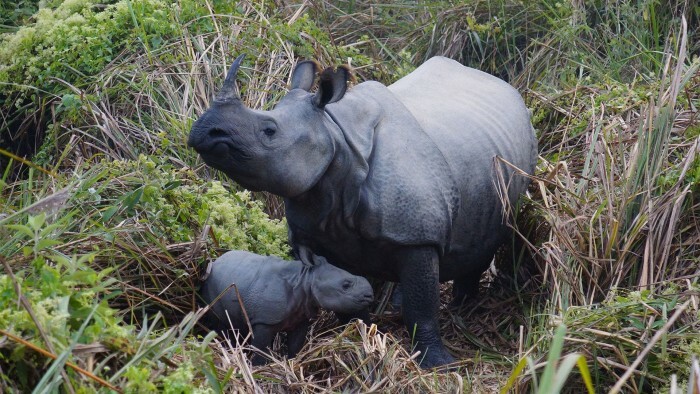 Chitwan National Park tour offers wilderness of rich ecosystem that offers variety of rare and non-rare mammals, birds, reptiles and aquatic animals. Travelers get to witness a lost world of towering trees and twisting vines , pre-historic rhino and lumbering elephants, crocodiles, python, deer, magnificently colored birds and if lucky – the magnificent Royal Bengal tiger. This protected park is also common home to other wild species – rhesus monkey, grey langur, leopards and wild cats. The cultural experience of ethic Tharu community adds another dimension to the tour. Travelers will experience many jungle activities like Elephant back jungle safari, jungle walk, canoe ride, jeep drive, elephant bathing and more. Tour permits and passes for sightseeing in Kathmandu and Pokhara. Jungle activities charges in Chitwan. Any other expenses not mentioned in above cost include section. Upon your arrival in Tribhuvan International Airport, our representative will receive you and transfer you to the hotel. After short refreshment, introduce to your trip leader and he will make short briefing about next day’s trip. After breakfast, we proceed for visit to UNESCO world sites in Kathmandu. Kathmandu valley has one of the densest concentrations of heritage sites. The Kathmandu city alone protects four UNESCO world heritage sites. We will visit ancient heritage site of the city that includes Pashupatinath (highly revered Hindu temple), Swayambhunath ( 2,000 years old monkey temple), Boudhanath Stupa (largest stupa) and Kathmandu Durbar Square ( ancient royal palace). All these sites are venerated by the people of city and the religious places are held in high regards by Hindus and Buddhist. Pashupatinath is considered as one of the holiest temple of Lord Siva and the cremation process can be observed along the bank of Bagmati River. Swayambhunath, located at the top of hill, is sacred site for both Hindus and Buddhist. It offers 360 degree view of city and emerald hills around. Likewise, Boudhanath is the largest Buddhist mandala in the world. Visiting Durbar Square allows you to explore ancient palaces, buildings, temples and statues from medieval times. These all sides holds country’s great cultural and religious tenor. After sightseeing, we drive back to the hotel. After early morning breakfast, we drive to Chitwan located 175 kilometer from Kathmandu. We drive down along the zigzag road along the bank of the Trishuli River. After hotel check in, we will get short briefing on the activities we will be engaged in Chitwan National Park. Then, we walk on the bank of the Rapti River to admire the amazing sunset over the sub-tropical jungle of Chitwan. In the evening, we attend the cultural dances of Tharu community while enjoying the delicious cuisine. After early morning breakfast, we will enjoy elephant jungle safari through the dense forest and grassland to witness wildlife in its natural environment. We also visit elephant stables and enjoy elephant bathing. In afternoon, enjoy the canoeing ride to get the close peek of Gharial and Mugger crocodile. We also get to enjoy the fresh water dolphins, otters and variety of water birds. If time permits, we go for nature walk and birdwatching and get closer to the variety of wild floral and faunal species. After breakfast, we will leave the plain land of Chitwan and drive north towards Pokhara. Some vantage point during the drive offers the mesmerizing view of Himalayan peaks, verdant hills and cascading white waterfalls. Drive to the hotel at lake side and get some rest. In Pokhara, we visit Davis Falls followed by Gupteswor cave and Seti Gorge, Mahendra cave, Bindhayabasini temple. In the evening, enjoy boating in Few Lake. Early in the morning, drive to Sarangkot hill which takes 40 minute drive via car. We enjoy the mesmerizing sunrise view and snow-capped peaks. If you wish, you can enjoy paragliding, zip flyer and bungee jumping. Drive back to Kathmandu and take a well-deserved rest at hotel. Enjoy evening tour around the bustling city Thamel.